POWER struggles in the MDC turned violent at the weekend after party leader Nelson Chamisa’s supporters allegedly physically assaulted secretary-general Douglas Mwonzora’s sympathisers, ahead of the opposition party’s elective congress, next month. Mwonzora has, over the past few weeks, earned himself the wrath of Chamisa supporters’ anger following reports that he was eyeing the party presidency. Supporters from the two rival camps fought running battles in Chitungwiza on Saturday in the skirmishes which left Chitungwiza former deputy mayor Jabulani Mtunzi and several other party activists seriously injured. Party sources told NewsDay that Mtunzi, who is believed to be sympathetic to Mwonzora, was admitted at Chitungwiza Central Hospital. The clashes occurred during selection of candidates for the party’s district organs. Mwonzora confirmed the incident yesterday, and called for the perpetrators’ arrest and disqualification of candidates fomenting violence. “The violence that is taking place is extremely disconcerting,” he said. He confirmed that most of the victims were his supporters, but could not confirm allegations that the perpetrators were acting on Chamisa’s orders. Mwonzora said he had not yet officially made up his mind which post to contest at the congress, although sources close to him said he was eyeing Chamisa’s presidency. Both Mwonzora and Chamisa squared off in the 2014 elective congress where they contesting for the secretary-general’s position. 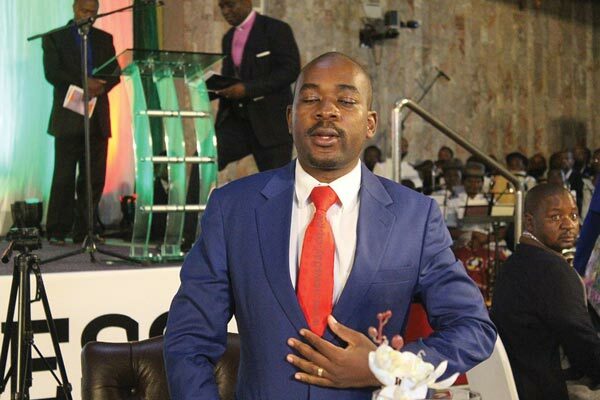 Chamisa lost the race, but was later handpicked for the party’s vice-presidency by the now late MDC leader Morgan Tsvangirai. Although both Chamisa and his spokesperson Nkululeko Sibanda could not be reached for comment yesterday, party spokesperson Jacob Mafume said congress preparations were going on well despite the “isolated cases of indiscipline that will be thoroughly investigated”. “We are still to get reports, but as you know, our district meetings have been going on from Saturday and Sunday and we will get the feedback,” Mafume said. “We deployed provincial and national members to monitor and supervise the process and they will give full reports. We have hundreds of district meetings going on, the bulk of them going on without any incident. Mafume said the opposition party had a clear and detailed complaints filing mechanism, adding that those aggrieved must utilise the facility. MDC national organising secretary Amos Chibaya described the Chitungwiza violence as unfortunate. “We don’t have room for violence in our party. Those people causing violence belong to Zanu PF, they have Zanu PF demons and by so doing they have fired themselves from the party. Our template is very clear, we don’t tolerate violence,” Chibaya said. He, however, denied reports that the instigators were working on Chamisa’s behalf. “The violence has nothing to do with the senior leadership. People want positions because the MDC is a democratic party and it is a freedom train. No one wants to be left aside. The violence has nothing to do with anyone in the leadership,” he added. The post Rival MDC camps in bloody clashes appeared first on NewsDay Zimbabwe.